It's a good thing to know that Airtel is reviving the lost joy and fun of Smartphone users who had long used any free/cheap browsing tips. Introducing the first Airtel free browsing tip for the year 2018. 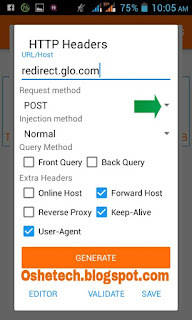 This trick will give you 2GB of Data when you recharge N100 and 10GB for just N500. NOTE: This data plan can be used on all devices either on Android, iPad, iOS, Linux, windows, etc to access the internet, it's just like the usual data plan we subscribe for though, it's cheaper and almost free. • Not all Airtel SIMs can redeem this offer, especially old Airtel SIMs. Airtel made this offer available to only SIMs that was moved to Airtel networks. To enjoy this free browsing offer, you'll have to port/move your SIM to Airtel NG. You may not want to port your current line to Airtel NG, you can get a new registered SIM (either MTN, GLO or 9mobile)- most preferably MTN and then port to Airtel NG to activate the free browsing. All that's required is a registered MTN NG SIM and a valid Identity card (Voter’s card National ID or Driver’s Licence). • Tell the customer attendant you want to port your MTN SIM to Airtel NG. • A form will be given to you to fill. Make sure you finish the porting process. • You'll receive a message on your phone confirming your action. To know if it worked, reboot your phone and you will notice the absence of the MTN NG network. • Switch off your phone and re-insert SIM card as directed. • You'll receive a message telling you the port was successful. We're almost there, haven successfully ports to Airtel NG, you will only be receiving free data when you recharge via a specific method. This is one important part you shouldn't miss! Please if you haven't used Zoto Recharge Wallet before, click here to know more about the app. I've been using the app for over three years and haven't made any regret. Download the app and apply this coupon code (OMOREC2) when making your first recharge. • Recharge your Airtel NG SIM with at least N100 either from Bank or Zoto Recharge Wallet. • You'll get a message that you’ve received 2GB free data. • To get more data even up to 10GB, repeat the first procedure, that is, you will have to recharge again. Yes, it can be accumulated. HOW LONG IS THE FREE DATA VALID? Just like every other data subscription, this free browsing data is valid for 30 days, that's what makes it so unique. Please make sure you follow the above procedures to get your whooping 2GB data for just N100 on your Airtel NG SIM. 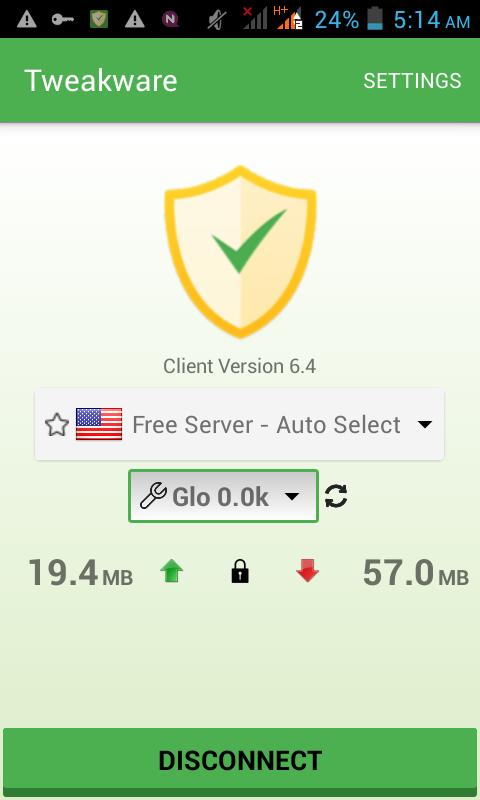 Enjoy browsing the internet and downloading even large files without bandwidth limit at no cost on Glo network using Anonytum VPN. It is no longer new to us that so many VPN services are now available in Android Market today giving network subscribers chances of browsing the internet for free. Browsing at no cost using VPN apps is now very common these days especially with 9mobile (formerly known as Etisalat) and Glo Networks. Most subscribers of these network services are having good time surfing and downloading even large files from the internet with little or no expense. The first topic I published on this blog is similar to this one, that was with tweakware VPN and is still working up till now. And here is another free browsing VPN app called Anonytun VPN. This VPN works better with the above-mentioned networks if not even better than tweakware. It does not consume much RAM and battery. One thing I love about this Anonytun VPN is that it does not disconnect itself often. 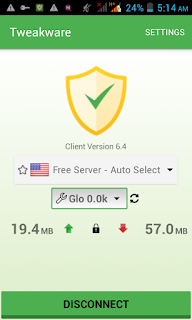 I am currently using this Anonytun VPN to browse freely with Glo and 9mobile. 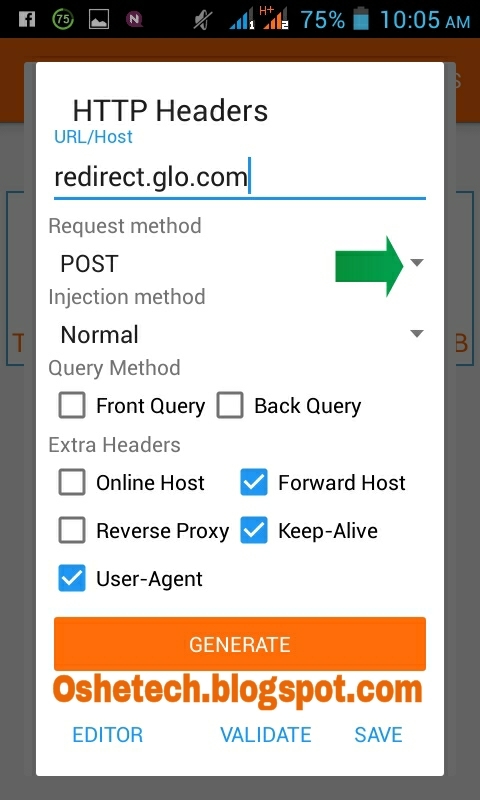 I will be dropping procedures on how to set Anonytun VPN to browse unlimited with Glo network. I would love to drop the settings for 9mobile but the connection is currently having issues so I will publish it when the bug has been fixed. Download Anonytun VPN here, or download it from Google Play. Get a Glo sim card with neither data subscriptions nor airtime in it. Haven installed Anonytun VPN, open it and configure the below settings in their respective areas. Click on Generate and Save. You are done configuring Anonytun VPN in connection with your Glo line. Now go back to the app main page and hit CONNECT. Within few seconds, you should have it connected and when that happens, just minimize the app and start browsing the internet. 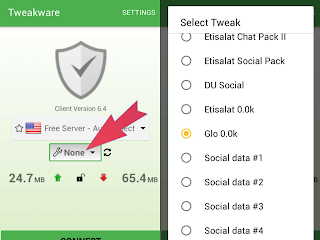 Tweakware v6.4 is most suitable for free browsing with Glo and Etisalat. It has one free server with multiple servers in it. That is, it's free server is auto-select. In case you have not heard about a mobile app called Tweakware, you better know what you are actually missing. Tweakware is a VPN app which allows you to browse freely or at low cost on your smartphone device. This app has been in existence For over three years, I have known Tweakware since 2014 and yet I still recommend it as the best life-saving app whenever I am short of data. Surfing the net and downloading with tweakware is easy and convenient especially when using its latest version. As usual, tweakware works almost with all network available in Nigeria depending on the tweak available. Like me, Glo NG and Etisalat NG has been my favourite choice whenever I go for tweakware. Haven known what Tweakware is all about, let's now discuss the features of latest tweakware version 6.4. For those who are familiar with the early versions of tweakware, the tweakware v6.4 is designed with a new interface with a means of selecting bundle type (GSM Operator). 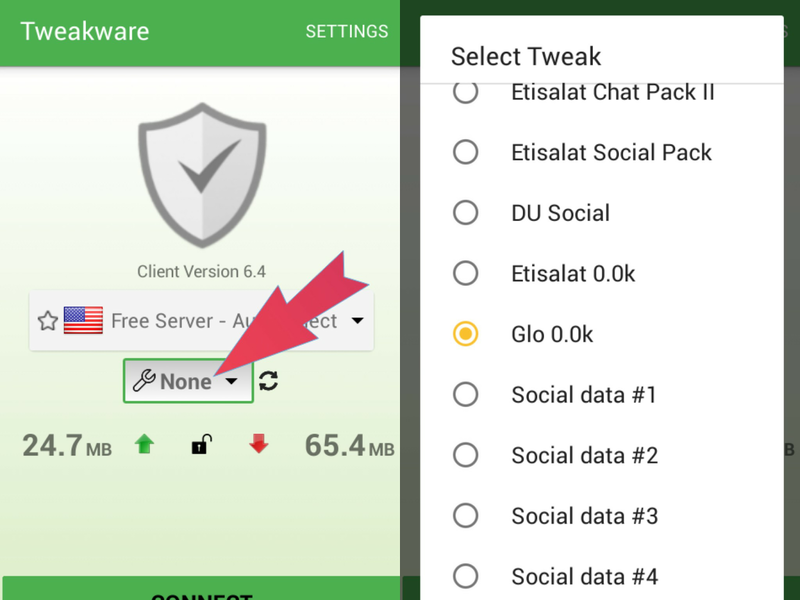 And from what I have seen so far, the networks available in tweakware v6.4 are mainly Glo NG and Etisalat NG and both allow you to browse at no cost. See screenshot below. Also, tweakware v6.4 allows you to create a custom tweak to a designated network using a working host and port addresses and other required configuring tweaks. Though I am not sure if there is any custom tweak of any network for now. As for the servers, this tweakware v6.4 has really proved to me that so many bugs have been fixed. Remember when earlier versions of tweakware have so many servers with almost all not connecting easily or are quick to disconnect when connected. This is extremely different from Tweakware v6.4 because it has only one free server with auto-select feature and is quick to connect and when connected it lasts longer. Let's discuss how it can be configured for browsing. Ensure you get Tweakware v6.4 from Google Play or rather download it from here. Haven installed Tweakware v6.4, launch the app and click “None” displaying on the interface to pop up series of tweaks. Make your choice by selecting one of the tweaks listed, then go back and hit “connect” and make sure the next picture to display on your smartphone device is similar to the screenshot below. Note: If you are a free user, there is no need for selecting free servers as this tweakware v6.4 comes with auto-select free server feature. But if you're a premium user, there is need for you to select a premium server of your choice.